Ready or not, QE3 is here, and the long-term effects of this reckless money printing by the Federal Reserve are going to be absolutely nightmarish. The Federal Reserve is hoping that buying $40 billion worth of mortgage-backed securities per month will spur more lending and more economic activity. But that didn't happen with either QE1 or QE2. Both times the banks just sat on most of the extra money. As I pointed out the other day, U.S. banks are already sitting on $1.6 trillion in excess reserves. So will pumping them up with more cash suddenly make them decide to start lending? Of course not. In addition, QE3 is not likely to produce many additional jobs. As I showed in a previous article, the employment level did not jump up as a result of either QE1 or QE2. So why will this time be different? But what did happen under both QE1 and QE2 is that a lot of the money ended up pumping up the financial markets. So once again we should see stock prices go up (at least in the short-term) and commodities such as gold, silver, food and oil should also rise. But that also means that average American families will be paying more for the basic necessities that they buy on a regular basis. 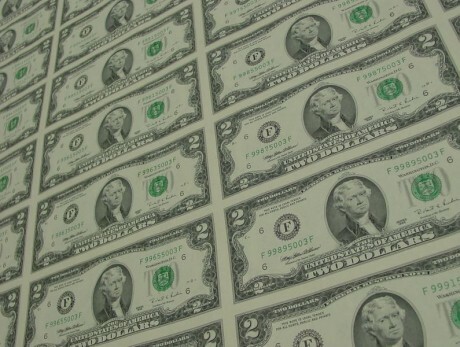 The most dangerous aspect of QE3, however, is what it is going to do to the U.S. dollar. Most of the rest of the world uses the U.S. dollar to conduct international trade, and by choosing to recklessly print money Ben Bernanke is severely damaging international confidence in our currency. If at some point the rest of the world rejects the dollar and no longer wants to use it as a reserve currency we are going to be facing a crisis unlike anything we have ever seen before. The real debate about QE3 should not be about whether or not it will help the economy a little bit in the short-term. Rather, everyone should be talking about the long-term implications and about how QE3 is going to accelerate the destruction of the dollar. "It means we are weakening the dollar. We are trying to liquidate our debt through inflation. The consequence of what the Fed is doing is a lot more than just CPI. It has to do with malinvestment and people doing the wrong things at the wrong time. Believe me, there is plenty of that. The one thing that Bernanke has not achieved and it frustrates him, I can tell-is he gets no economic growth. He doesn't do anything with the unemployment numbers. I think the country should have panicked over what the Fed is saying that we have lost control and the only thing we have left is massively creating new money out of thin air, which has not worked before, and is not going to work this time." "This is a disastrous monetary policy; it's kamikaze monetary policy"
"This is the nuclear option for them. This is a never-ending weapon that is being fired at the middle class"
"People like me will benefit from this." "Quantitative easing-a fancy term for the Federal Reserve buying securities from predefined financial institutions, such as their investments in federal debt or mortgages-is fundamentally a regressive redistribution program that has been boosting wealth for those already engaged in the financial sector or those who already own homes, but passing little along to the rest of the economy. It is a primary driver of income inequality formed by crony capitalism. And it is hurting prospects for economic growth down the road by promoting malinvestments in the economy." "That's absolutely nonsense. The Fed is just propping up the banks." "I happen to believe that eventually we will have a systemic crisis and everything will collapse. But the question is really between here and then. Will everything collapse with Dow Jones 20,000 or 50,000 or 10 million? Mr. Bernanke is a money printer and, believe me, if Mr. Romney wins the election the next Fed chairman will also be a money printer. And so it will go on. The Europeans will print money. The Chinese will print money. Everybody will print money and the purchasing power of paper money will go down." "I think this will end up being a trillion-dollar commitment by the Fed"
"I want to be clear - While I think we can make a meaningful and significant contribution to reducing this problem, we can't solve it. We don't have tools that are strong enough to solve the unemployment problem"
"[T]he FED's QE3 will stoke the stock market and commodity prices, but in our opinion will hurt the US economy and, by extension, credit quality. Issuing additional currency and depressing interest rates via the purchasing of MBS does little to raise the real GDP of the US, but does reduce the value of the dollar (because of the increase in money supply), and in turn increase the cost of commodities (see the recent rise in the prices of energy, gold, and other commodities). The increased cost of commodities will pressure profitability of businesses, and increase the costs of consumers thereby reducing consumer purchasing power. Hence, in our opinion QE3 will be detrimental to credit quality for the US…."